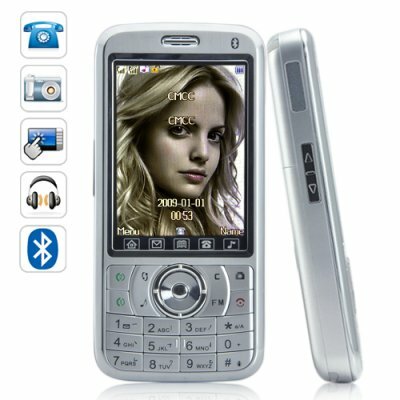 Successfully Added Osiris - Quadband Dual SIM Touchscreen Worldphone to your Shopping Cart. For all our customers who were sad to see The Pegasus M55 cellphone discontinued, we're proud to introduce its successor, The Osiris, a big screen 3 inch touch dual SIM unlocked cellphone with the latest touch screen interface for the best end user experience! The Osiris cell phone is a quad-band mobile phone supporting the four global standard GSM frequencies (850MHz, 900MHz, 1800MHz, 1900MHz) so you can be confident that it will work anywhere around the world. It comes with two SIM card slots with dual-standby function so you can be assured of never missing a business or personal call again with two active phone numbers stored inside one individual mobile phone. The Osiris cellphone comes fully unlocked, meaning you can you use it with any network you choose. And if all that was not enough, The Osiris comes with a free 2GB TF microSD card ready for you to store all your favorite music files and enjoy them on the go. The sheer beauty of this full-featured mobile phone with its aesthetically pleasant design and silver finish makes the full-featured Osiris feel great and smooth in the palm of your hand. Did we say full featured? Check out what you get with this mobile phone; FM radio receiver, MP3/MP4 player, digital camera and video recorder, image viewer, portable file storage, and even an Ebook reader. However, phone functionality and ease of use are where this baby shines - a crystal clear polarized 3 inch QVGA touchscreen display, built in stereo speakers, and an innovative extended function keypad is just part of package. So say bye to The Pegasus and say hi to The Osiris! If you're in the market for a new phone for yourself or the one you love then this is the phone for you! The Osiris was designed to be the easiest phone you will ever use. Made for today's busy lifestyle, this mobile phone really will cater to your every need, whether you are a corporate executive or soccer mom. The Osiris is in stock now for single piece or large bulk purchases. Order it now and we will express ship it out the very next day. Oh and don't forget to sell your customers additional add-on accessories like belt clip cases, protective sleeves, and Bluetooth earpieces to maximize your profits. Brought to you from the leader in online factory direct wholesale China electronics - Chinavasion. I'm a reseller and I've had a lot of success with your Pegasus phone, M55. I used to sell several hundred a month. But then it was discontinued. So now you're telling me that this is the new improved Pegasus? Sort of. At Chinavasion, we're very attentive to the needs of our customers and resellers and when the Pegasus was discontinued, we received a lot of feedback from you all, and basically the message was the same: bring back the Pegasus!!! In analyzing the success of the Pegasus, we found that the reason it did so well was that it was an amazing sub-100 dollar phone. Hence, we brought out the Osiris to cater to that segment of the market. Hi, will these phones work with any network provider? like Rogers or Fido? The phone is fully unlocked and quadband, this means that the phone will work on any GSM network provider (carrier) in the world using standard SIM cards.